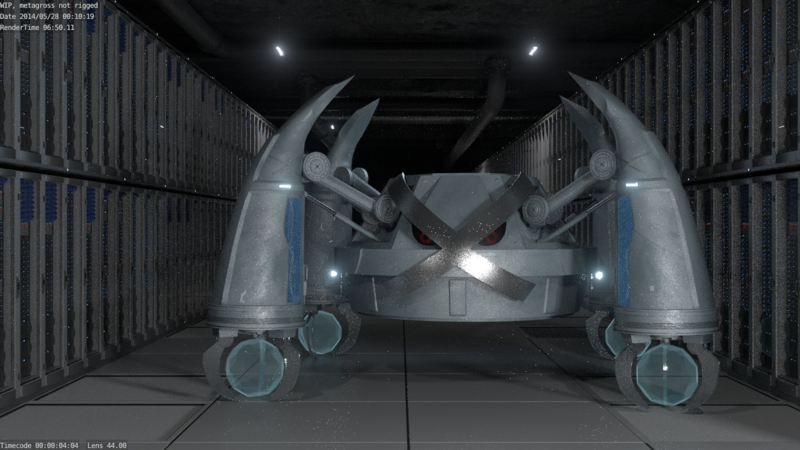 Textures aren’t 100% done, I still want to do some decals on Metagross. And the floor could use a little touchup too. Also, been debating on whether or not have a glossy clearcoat (like on a car) on Metagross. It looks cool, but I’m not sure it fits with the metal texture. Metagross still isn’t posed. The mechanical rig is actually pretty much done (FK arm movement works), I just need to finish hooking up the other 9(!!) claws and do the control rig. I also want do a short animation with it, like a sort of product demo video. Might need a few other rig controls for that though. This entry was posted in WIPs and behind-the-scenes and tagged WIP. Bookmark the permalink.